Before Christmas, a friend of mine asked for some advice on software and hardware for ripping old LPs to MP3s; something that she could give her dad as a present. 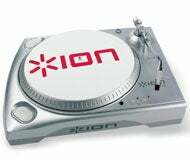 I recommended a mainly software solution, but a couple of companies have gone a more comprehensive route by providing turntables that connect directly to your computer. The New York Times has a comparison of Ion's iTTUSB (pictured; $199) and Audio-Technica’s LP2Da ($179-$199). There are good and bad in both. The Ion, for example, is PC and Mac-compatible, though that seems to largely be because it currently relies on open source program Audacity for its recording. It also uses USB versus the LP2Da's analog line-input method. I don't see any reason why you couldn't use the LP2Da with a Mac, as it's just passing sound through a minijack; it's just the included software that's PC-specific (and Parallels or Boot Camp users are likely to be able to take advantage of even that). Both turntables also require a degree of assembly, and you'll need to clean your LPs of dust either way. How about the results? The author and a friend couldn't tell the difference between .WAV files burned on CD and the original LP played through the same stereo system, but true audiophiles will probably pooh-pooh the idea that they sound anything alike.